On the right is my wife's first computer, an AT&T 3B1. It has a 68010 processor with 2 Mbytes memory and 67 Mbyte hard drive running Unix. We were showing some of the games my wife ported or installed on it. It was used from 1987 to around 1995. 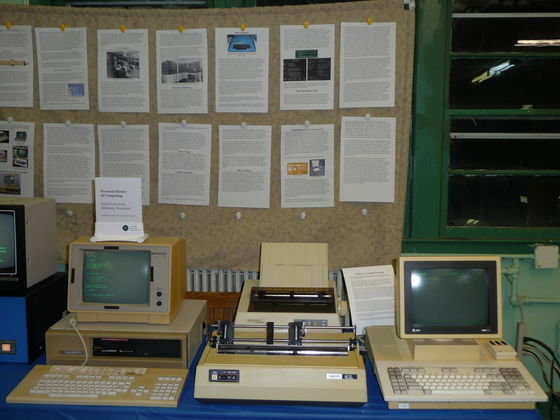 The printer in the back is a 24 pin Seikosha SL-80IP which was purchased for the 3B1. The printer in the front is a 9 pin Okidata microline 93 which was purchased with the TI. Getting this computer working involved getting the drive working and replacing the battery on the motherboard. I used wires to remotely mount a BR series battery in one of the empty expansion slots to reduce the chance that a leaking battery will damage the motherboard. The battery is only used for the clock so its not required but dead battery should be removed.